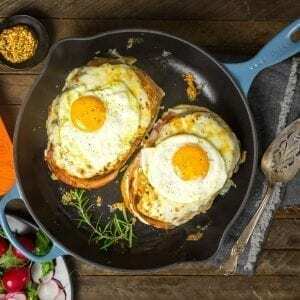 The croque madame is a quintessential dish in the French culinary canon. 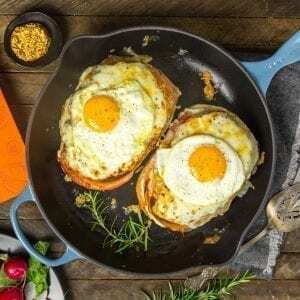 Essentially a ham and cheese sandwich, this beauty is elevated by two generous layers of creamy béchamel, broiled until bubbly and golden, and topped with a perfectly fried egg. With a little help from our friends at Le Creuset, we’ve used both their new recipe book and their bakeware to put together a perfect brunch dish. We’ve mentioned before in the blog that there are certain kitchen items that we can’t do without. We just can’t, we’d be lost and flailing. A microplane for fine grating, a silicone spatula for mixing cake batter: these critical objects are non-negotiable. Another, of course, is a good, heavy, enameled cast iron skillet. You can pre-heat it on the stove to get it to a high temperature for quick cooking, you can transfer it to an oven or broiler for a finishing step, and if you take care of it, it will last forever. Also, if you choose well, it can be beautiful enough to be the centerpiece on your table. 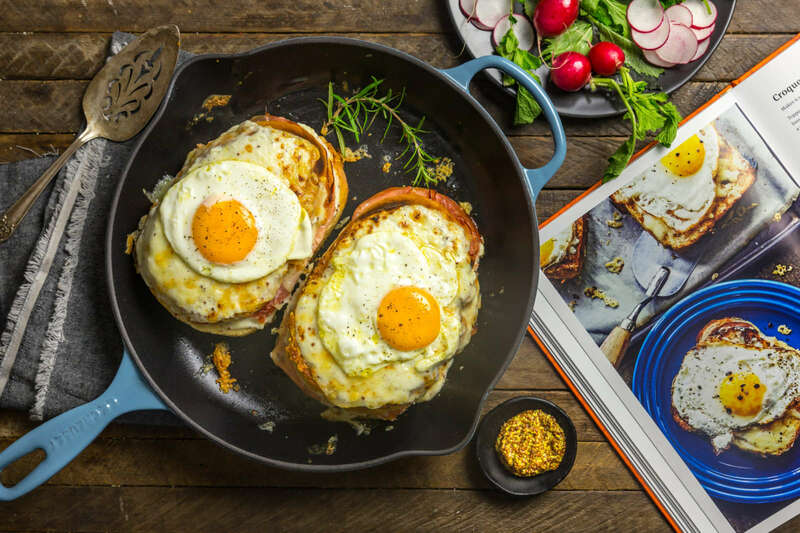 We’re always keen to find new ways of using our pan, and when Le Creuset asked us to make a recipe from their new cookbook (which you can buy from their site through the link) our decision wasn’t hard: we wanted to make our favorite Parisian lunch, croque madame. Our Le Creuset enameled cast iron skillet is one of the best kitchen workhorses we have. It’s perfect for this dish. And we love the color! (This one is Marine, a new color range). When we had occasion to take a road trip around rural France in 2010, we had to pay careful attention to the time: many cafés have strict lunch hours, and if you show up at a single minute past 2pm, you’ll be out of luck. Of course, you can pick up the bones of a great picnic-style lunch from boulangeries, charcuteries, and, hell, even petrol stations have great bottles of wine, but there were definitely times that we just wanted to take a break from driving and extemporaneous food choices and get a real café meal. And one thing we found over and over on lunch menus, and tried whenever we got the chance, was the croque monsieur, and its cousin, the croque madame. The former is nothing more nor less than, in British parlance, a ham and cheese toastie; the latter, the same thing topped with a fried (or occasionally poached) egg. And of course there are regional variations and even dessert versions where the fillings are replaced with chocolate and sweetened cream cheese, but pared down to its essentials, the croque sandwich is grilled ham and cheese. And of course that’s something we’ve made many times. But we’d never really gone back to basics and looked into the ingredients and technique that help to build a genuinely great croque madame. When your pan is this beautiful, you want to keep it on the table as long as possible. 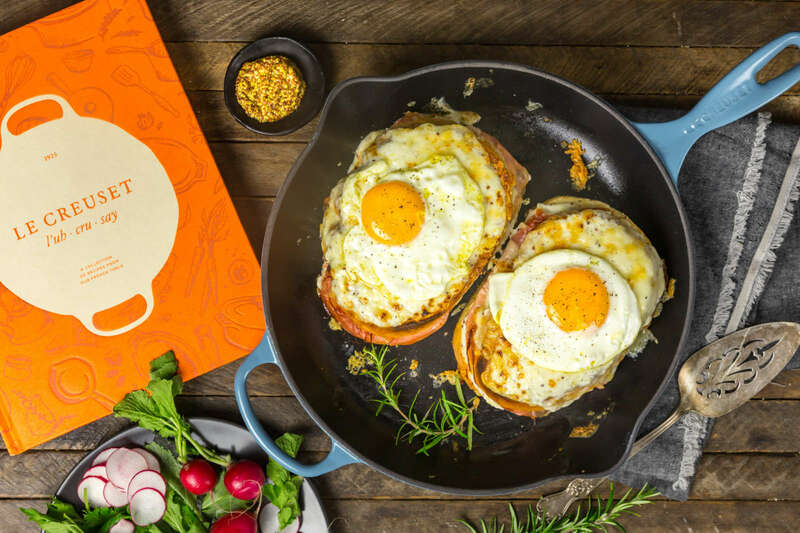 So, given the chance to take a peek at the brand new Le Creuset cookbook, we were thrilled to see a recipe for croque madames which added an extra twist in the form of béchamel sauce. (We used a béchamel converted into a mornay to enrich our home-made lasagna bolognese last year.) This is the kind of book we love to have on our kitchen shelf: not just a series of inspiring recipes and really-enviously-good food photography, it helps you go back to basics with cooking along classical French lines. Starting with setting your mise en place – making sure everything is efficiently in its place before cooking – and thoughtfully using sturdy cookware, good ingredients and time-honed techniques, you realize that home-cooked, really good French food is achievable. This is the kind of book I wish I’d had 20 years ago when French cuisine seemed so intimidating! We actually had a tough time at first trying to decide which recipe to make from the book – Duck Confit! Cheese Soufflé! Fish Provencal! Each was as enticing as the next, but as we were poring through it, the reminiscing began and one of us said “Hey, remember those croque madames we had in France?” and that, as they say, was that. Good, simple ingredients – bread, ham, cheese – go into making this, so find the best quality you can! Just like with a regular ole’ grilled ham and cheese, the cheese you opt for will determine the nature of the croque madame. You want a cheese that melts easily to get that a-little-bit-gooey, a little-bit-crunchy perfection. Gruyere is ideal for this. It has a mild, nutty flavor that complements the other ingredients. For the ham, if you can find a good quality French variety, go for it, and have it sliced thin so you can layer in a few slices to each sandwich. Any mild, not too salty variety will work here. 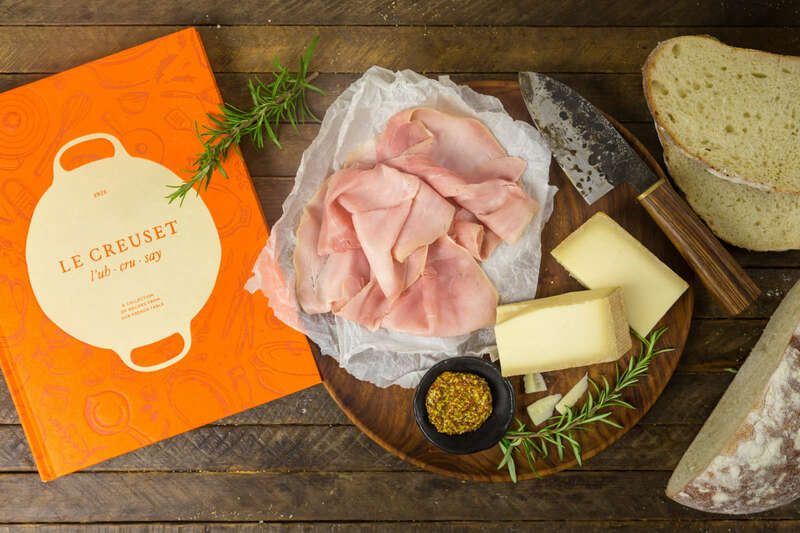 We were impressed with how simple the Le Creuset recipe is, but how much flavor the end result has. As usual, the devil is in the details. The hot, buttery, just-grilled bread is rubbed with a cut garlic clove. Oh, the scent. The scent. The béchamel (essentially a simple white sauce), is seasoned perfectly with fresh rosemary, a good grating of nutmeg and a spoonful of grainy dijon mustard. This moistens the inside of the sandwich, but more importantly, blankets the top which then gets loaded with grated gruyere cheese and broiled to a bubbling, golden, gooey, platform, onto which you place your egg. It’s ridiculously tasty. While we would happily eat a croque madame any time of day, this is pretty much an ideal brunch dish. Serve it straight out of the (gorgeous) pan, with a simple salad (we like spicy, fresh radishes simply sprinkled with sea salt) with a glass or two of good rosé. We like to think our versions look almost as good as the Le Creuset ones. Almost! So yes, you could make yourself a grilled ham and cheese sandwich and walk around the house scarfing it down. 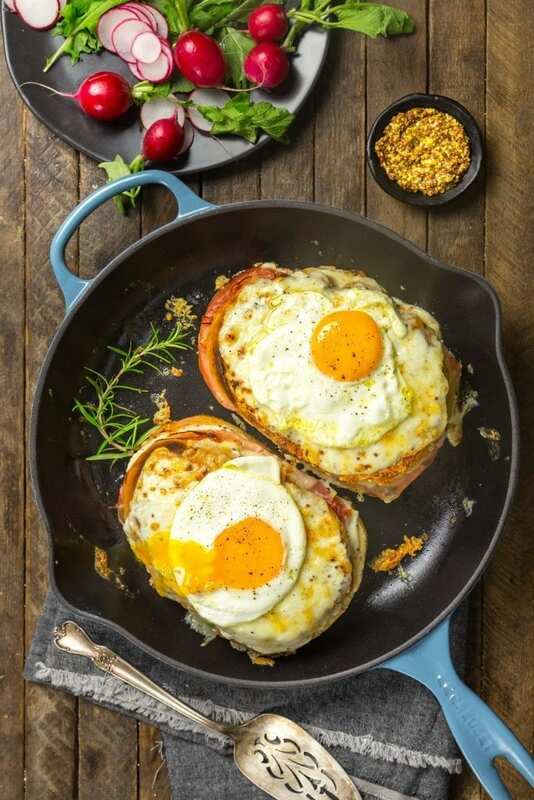 But we recommend you take the time to put together, with care, the elements of a croque madame: the sandwich, the Béchamel sauce, the egg – serve it up with a green salad and relish the idea of good, slow, thoughtful food. In a small sauce pan, melt the butter. Whisk in the flour and cook, whisking constantly, 2 minutes. Do not let the flour brown. Whisk in the milk and add the rosemary. Cook, stirring occasionally, until thick, about 10 minutes. Remove the pan from the heat and discard the rosemary. Whisk in the mustard, nutmeg, salt and Espelette pepper. Keep warm over very low heat. Butter one side of each bread slice. Spread the other side of four of the slices with about 1 tablespoon Bechamel and top each with one-quarter of the ham. Sprinkle one-eighth of the Gruyere on top of each. Cover each sandwich with a remaining bread slice with the buttered side facing out. Warm a large skillet over medium-high heat. Grill each sandwich until both sides are toasted and golden brown, about 2 minutes per side. Transfer the toasted sandwiches to a rimmed baking sheet and rub both sides of each with garlic. The toasted bread will gently grate the garlic. Preheat the broiler to high. Spread 2 tablespoons béchamel on top of each sandwich. Sprinkle the remaining Gruyere evenly over the sandwiches. Broil until the cheese is bubbly and golden brown, 2 to 3 minutes. In a large skillet over medium-high heat, warm the oil. Crack the eggs into the skillet and fry until the white of each is cooked through for sunny-side-up, about 3 minutes, or flip and cook the eggs on the other side for over-easy. Top each sandwich with a fried egg, season with salt and pepper, and serve at once.